Getting There: Airlines traveling to Zurich, Switzerland from the United States include American, Delta, Swissair, United, Northwest, Lufthansa, Scandanavian, British Airways, and Air France. The 1-800 phone numbers and Web links are listed in this magazines Airlines page. From Zurich, train service to Interlaken is the easiest, most direct travel method. 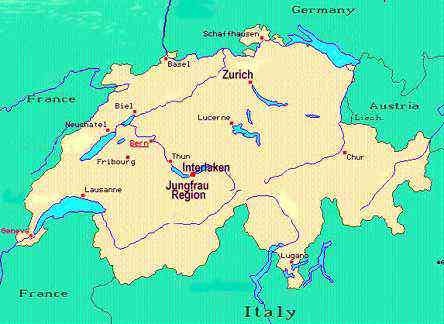 Interlaken is 161 km (100 miles) from Zurich and takes approximately three hours. The Rail Europe Web link offers schedules and fares. 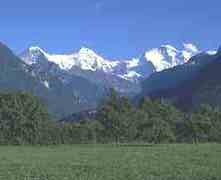 From Interlaken, take a train from the Interlake East (Ost) station to the Jungfrau. If you drive, we recommend you rent a car from the United States before traveling. Most major car rental agencies service the Zurich Airport. The 1-800 phone numbers and Web links are listed in this magazines Autos page. Staying There: All levels of accommodations, from youth hostels to 5-star hotels to camping sites, are available in and near Interlaken, a resort community between two lakes, Thun and Brienz. Interlaken is also a jump-off point for a variety of travel and adventure opportunities in the nearby Jungfrau Region with excellent train service and, on the lakes, boat service. For information contact the Interlaken Tourismus, Hoheweg 37, 3800 Interlaken, Switzerland; telephone 41-33-822-2121, fax 41-33-826-5390. Rick Steves' Germany, Austria, and Switzerland is an excellent guidebook, including recommendation the Jungfrau region. This and other guidebooks covering Switzerland are available through the Travel Bookstore. Fast Facts: Adventure opportunities in the Jungfrau Region are offered by a variety of commercial outfitters. Possibilities including mountain climbing, canyoning, rafting, paragliding, mountain biking, canyoning, rock climbing and bungee jumping. More relaxing outings such a gentle hikes and visits to mountain cheese making farms are also popular. For information write: Adventure World, 3800 Interlaken, Switzerland; or telephone 033 826 77 11, or check out their Web link below.